The city of Westlake, Ohio, got an interesting ‘wake up call’ in 2006 when a sanitary sewer interceptor line in nearby city of Lorain failed dramatically. “It forced the evacuation of several dozen homes for months, and we realized we'd better take a closer look at our system, because we have a similar interceptor arrangement in Westlake, and our pipe is about as old as theirs,” said Westlake Director of Engineering Robert P. Kelly, P.E. The interceptor in question was built in the 1960s and runs from west to east along Westlake’s northern limits, increasing in size from 36 to 60 in. Dozens of 18- to 24-in. trunk lines serving the entire city drain northerly into the interceptor. The arrangement is efficient and has many advantages, but it has a few weaknesses as well; for one thing, a failed interceptor could affect all of Westlake. Interceptors also are particularly prone to microbiologically induced corrosion (MIC), an insidious plague of concrete sewer systems. In Westlake, the south-north trunk lines dump directly into the interceptor and are constructed with 24-in. drops to keep flows moving quickly, which unfortunately creates a great deal of turbulence. Turbulence—combined with organic waste, warm temperatures and oxygen—leads to high concentrations of hydrogen sulfide gas. The gas feeds colonies of Thiobacillus bacteria, which excrete sulfuric acid; some strains of Thiobacillus can thrive in acid concentrations as high as 7%. The acid attacks concrete directly, turning it into crumbly calcium sulfate (gypsum). Once established, MIC works from the inside out to destroy concrete integrity in as little as a few years. The interceptor had been cleaned and thoroughly inspected at the 40-year mark. But five years later, the Lorain interceptor failed, and Westlake retained URS Corp. to perform video inspection, complete detailed analysis and prepare an emergency evacuation plan in the event of failure. What URS found was disturbing. “When we inspected at year 40, we televised the lines—everything was in good shape,” said Westlake Field Engineer James J. Smolik, P.E. But five years later, URS found significant MIC damage. MIC had eaten away ½- to 1½-in. of the concrete pipe’s inner surface. “And, since the pipe thickness is only 6 in., we knew we had a problem,” Smolik said. There was some good news. MIC was confined almost entirely to within 25 ft of trunk line entry points, so conceivably Westlake could save money by focusing on problem areas and by leaving the rest of the interceptor alone. In theory, this would save about half of the cost of cured-in-place pipe (CIPP) rehabilitation, because the overall footage of rehabilitated pipe would be reduced by more than half. “We actually did a whole design based on that idea,” Kelly said. But there were problems with that approach. CCCP is a proven technology for pipe rehabilitation, but it was not a good choice for the particular situation in Westlake. For one thing, CCCP runs generally are manhole-to-manhole, and there is not much money saved by specifying shorter, partial runs. CCCP also is not a good fit when pipe diameter changes, as it does several times in the Westlake interceptor. And finally, manholes that serve the interceptor are quite deep in places, and they would have to be excavated and dismantled to maneuver in felt linings. This was more work than Westlake wanted to do for a partial rehabilitation. These small challenges added up to one big problem. Westlake was trying to avoid state or federal money for this project, and had approximately $2 million available. Smolik attended the Pumper & Cleaner Environmental Expo in Louisville, Ky., in search of ideas. After a great deal of research and conversation, he returned with two good ones: a new product and a new technology. The new product was ConmicShield, a concrete additive that permanently inhibits MIC. This product is easily dosed into concrete and bonds molecularly with the concrete. The treated concrete is antimicrobial and permanently inhibits the growth of Thiobacillus bacteria for the concrete’s entire life cycle. This protection is not new; it was used in shotcrete for a major trunk sewer rehab in 1997 in Atlanta. It has since been adopted by a number of very large municipalities, including Chicago in the world’s largest manhole rehabilitation project to date. CentriPipe (centrifugally cast concrete pipe) lining technology is offered by AP/M Permaform. 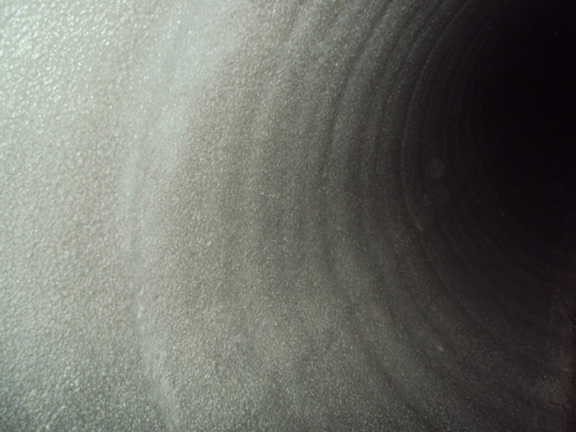 In essence, It is a way to centrifugally apply one or multiple layers of high-strength structural grout onto deteriorated pipe interiors at diameters ranging from 30 to 120 in. The grout products developed by AP/M Permaform are designed specifically for structural reinforcement, long pumping distances, rapid curing for a quick return to service and high build of pipe crowns. It also is not completely new—AP/M's patented variation called Permacast has been used in manhole rehabilitation since 1985, but the Westlake interceptor was one of the first applications of this magnitude in horizontal pipe. Using CentriPipe technology to apply ConmicShield-treated cementitious grout seemed like a good way to overcome the challenges Westlake faced. CentriPipe is a truly trenchless rehabilitation technology, and since the equipment can be introduced to pipe interiors via manholes, excavation is avoided. More importantly, the SpinCaster can be started and stopped at any point in the pipe, and adjusted as needed for changes in diameter—it seemed like a perfect way to focus on the interceptor’s problem areas and realize the savings city officials sought. Contractors diverted flows around individual trunk line entry points by using 12-in. pumps to move waste overland. The pipe area that was subject to rehabilitation was cleaned and scoured with a high-pressure spin washer to remove loose material. As a final step before applying new grout, Westlake designers called for a ConmicShield rinse of the cleaned interior to be certain MIC could not develop behind the new liner. After analyzing the interceptor’s interior diameter, water load, extent of damage and other factors, engineers determined that a ½-in. liner of PL-8000 grout with ConmicShield would be optimal. This would repair and strengthen the interceptor, and prevent corrosion while preserving flow characteristics. In all, Westlake rehabilitated only 3,961 lineal ft of interceptor, as opposed to the 7,200 lineal ft that would have been required by manhole-to-manhole rehabilitation. The work began in 2009 and was completed approximately a year later; this meant that seasonal adjustments had to be made as the work progressed. Smolik performed quality control by paying attention to the amount of dry mix used as work was done. He would calculate the amount needed per foot of rehabilitated pipe, and would check that the right amount had been used as work was performed. By watching the mix and spot-checking as needed, he could be sure that an even ½ in. was being applied. If the amount of dry mix used appeared to be off, sections of pipe were cored to verify thickness and patched as needed. Kelly notes that as the year progressed, the contractor grew more and more proficient. “Toward the end of the project, they could line about 350 ft a day—very impressive,” he said. Trying relatively new techniques and products is not always a comfortable position for city engineers, but the Westlake interceptor project shows that the rewards can be huge.